From its first introduction in 1967, Frank Zappa‘s “King Kong” was a composition made for solos – horn solos, keyboard solos, drum solos, guitar solos. “King Kong” had them all. It was also a vehicle for extensive jamming. 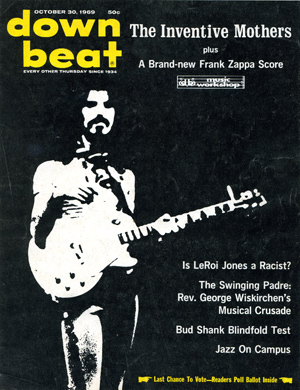 So, no matter the tour, no matter the particular ensemble, Zappa was there to determine exactly how structured the piece would or wouldn’t be, and what kind of atmosphere the particular solos would create – thus making “King Kong” a fan favourite whether it was performed by the original Mothers of Invention, the Hot Rats Band, The Roxy Band, or any of Zappa’s ensembles from the 1980s. Growing up as a Canadian teenager in the 1970s, one could literally count the number of well known “homegrown” musical groups and artists on the fingers of one’s hand (okay, maybe two). The trouble was that, at the time, Canada really didn’t possess a viable recording industry. For any Canadian musician or group to “make it”, they literally had to leave the country to do so. Whether you were Joni Mitchell, Anne Murray, The Guess Who, The Sparrows (who would become Steppenwolf upon their move to the U.S.), Denny Doherty (of The Mamas & the Papas), or Neil Young you had to relocate south if you wanted any kind of career. On more than one occasion, upon seeing the colossal size of my Frank Zappa music collection, I’ve been asked, “How many versions of Zappa songs do you really need?” Of course, to someone who isn’t a fan of Zappa’s music, or is new to the maestro’s music, wouldn’t understand. Especially in regards to live versions of Zappa’s work.